When debt collectors call, or send threatening letters, it’s easy to feel intimidated. These people have your contact information. They know you owe money. Who knows what else they might know about you? They exist for one purpose and one purpose only: to get you to pay up everything they say you owe. They talk about damage to your credit score. Maybe they even mention legal action against you. What can you do in the face of a money-sucking machine like that? The answer? More than you might think. But you have to be willing to fight. There’s a common misconception that debt collector who pesters you with calls works for the lender who gave you the original amount, like your bank, or at worst is someone your lender hired for this purpose. But the fact is, whether it’s an auto loan, a mortgage, a medical debt, or even a delinquent gym membership, your debt has likely been bought and sold multiple times. The person calling you to collect the debt most likely works for either a debt buyer or a collection agency; either way, it’s a company that doesn’t know the first thing about cars, homes, medicine, or workouts. These companies buy your debt for pennies on the dollar and then do everything in their power to get you to still pay them the full amount, plus interest and fees. You might think that a company that buys debt for a living would at least be good at it; that they would have detailed records on every debt they want to collect. As “Last Week Tonight with John Oliver” revealed, though, debt buyers frequently just receive a simple Excel spreadsheet with only the most rudimentary information about the debts, and little or no paperwork to prove that any of the information is actually legitimate. In fact, a Federal Trade Commission study found, “For most portfolios, buyers did not receive any documents at the time of purchase.” None. When information as sensitive as people’s debts is being bought and sold with nothing to support them but a simple spreadsheet, it’s inevitable that critical information will often be incorrect or go missing. And since the burden of proof is on the debt collector, you can use those mistakes to dispute your debt and get it reduced, or even forgiven entirely. In late 2018, Encore Capital Group—a debt buyer so massive that they told their investors in 2015 that 1 in 5 Americans either currently owed, or had previously owed them money—settled a lawsuit with 41 states and the District of Columbia requiring them to pay millions of dollars and forgive thousands of debts. All this because they had engaged in “robo-signing”—the practice of blindly signing off on paperwork and affidavits in bulk in order to sue people over debts without taking any steps to make sure these people actually owed the money in the first place. If robo-signing sounds familiar, that’s because it’s the same shady tactic that big banks like Wells Fargo, Bank of America, and JPMorgan Chase used to foreclose on thousands of homeowners during the financial crisis, before the courts forced them to stop. And now debt buyers like Encore are using the same tactics to go after people for debts of every stripe. Robo-signing is only the tip of the iceberg when it comes to the tricks companies will use to try to collect a debt. As anyone who has had the unfortunate luck to deal with an unscrupulous debt collector can tell you, their tactics can get much shadier, and much more personal. In November, 2018, the Federal Trade Commission and the State of New York filed a suit against a group of collection agencies run by Robert Heidenreich, who was encouraging his debt collectors to engage in “overbiffing”—trying to squeeze additional money out of people by claiming the Balance in Full (BIF) of their debt is higher than it really is. Heidenreich also had his debt collectors lie about their identities, defrauding thousands of people by claiming to be lawyers or law enforcement in order to intimidate them into paying their artificially inflated debts immediately. The collectors would become abusive if people refused to pay, and threatened to harass their families and employers. Aggressive tactics like these are sadly all too common (just watch the “Last Week Tonight” clip above for more shameful examples). They are also illegal under the Fair Debt Collection Practices Act (FDCPA). Unfortunately, a 2017 Supreme Court decision ruled that debt buyers are exempt from the FDCPA, but collection agencies—including those employed by debt buyers—must abide by it. Debt collectors will use any trick in their arsenal, from harassing phone calls to threats and lies, to get you to pay. You can stop the bleeding by using every tool at your disposal, too. The most powerful weapon you have may be the word “no.” Getting a call from a debt collector can be paralyzing, especially if they try to intimidate you by saying that you’re breaking the law (you aren’t). Take a deep breath and have the courage to say no to the phone calls. Just hang up. Then send them a letter telling them to stop contacting you. Be sure to keep a copy for your records. Start by keeping a log of every time they attempt to contact you. Keep every letter. Log every phone call. If someone shows up at your doorstep, note the date, time, and notes about what happened. If they break the law or reveal a deficiency in their paperwork, you want to make sure you have a record of it. If they sue you, make sure to respond in the time allotted. If you don’t respond, they win automatically. If you do respond, then they actually have to prove their case, which may be totally without merit. And if your debt is really out of control and collectors are making your life miserable, there’s a major card you can play: just stop paying. It’s an extreme step for extreme circumstances, but it can give you more leverage than you might realize. Looking for more assistance dealing with relentless debt collectors? DebtCleanse is here to help. You can create a premium account to get instant access to our powerful Action Tools, and our Letter Generator, as well as connection to our nationwide network of attorneys who are empowered to use DebtCleanse’s unconventional but effective methods to help people just like you break the cycle, settle their debt for a fraction of its original value, and take back their financial freedom. 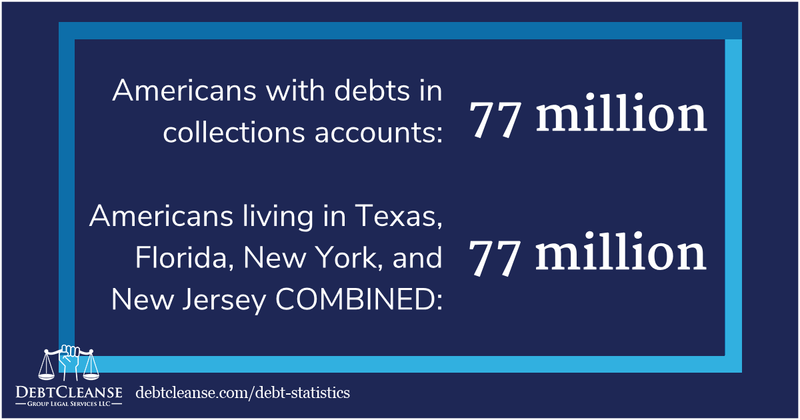 Want to keep up with all the latest news in DebtCleanse’s fight against outrageous consumer debt? Click here to sign up for our email list today.